Amira Aduma, a stand out Phoebus High School Girls Track Team member, has been named the Daily Press female track all-star for the 2016 season. All of us at Community Knights are so proud of Ms. Aduma, who started off her indoor season with an injury, but came back to win several state championship titles. 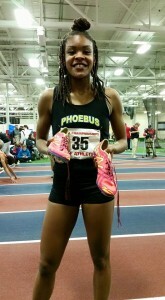 In addition to her accomplishments, the Boy’s Indoor Track Team brought home the state championship for PHS this season. 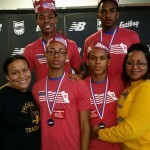 Andre Jackson, Imontae Parker, Ronell Jackson and Jaelen Williams went on to run the 4×400 relay at the New Balance Indoor Nationals in NYC. They advanced to the championships placing 3rd. They boys earned the title of All American Athlete. Community Knights supports the Phoebus Track program through grants from our GIFT (Grant Initiative Fundraising Team) program. Our GIFT program allows supporters of this amazing group of coaches and young student athletes to work side by side with supporters of other wonderful local non-profit and public school organizations to raise the money that ultimately will fund our grants. PHS Track has used their grant funds to obtain new competition gear, warm ups, equipment, registration and travel expenses.